1983 was the first model year that Isuzu’s Impulse (known as the Piazza in most other parts of the world) became available in the United States. The first-generation Impulse was built on a variant of the aging rear-drive T-body chassis used by the lowly Chevrolet Chevette but was definitely aimed at a notably different market. The Impulse came much better equipped than a Chevette: standard mechanical equipment for the $9,998 base price (about $25,700 in 2018 dollars) included four-wheel disc brakes and P195/60R14 tires (a size still readily available) on alloy wheels. Inside, power steering, power windows, power door locks, cruise control, air conditioning, tinted glass, a tilt steering wheel, and an AM/FM stereo radio were all included. Optional equipment was spare, with only an improved stereo and turbine wheels available. For 1983, power for the 2,700-pound Impulse was provided by a 90 bhp 1.9 liter/119 ci SOHC inline four with multi-point fuel injection (a turbocharged engine did not become available until 1985). Transmissions available were a standard five-speed manual and an optional four-speed automatic. Fuel economy with the manual transmission was 22 city/28 highway by the standards of the day (19/26 by 2018 standards). 0-60 took around 11 to 12 seconds, with a top speed of about 110 mph. With a 15.3-gallon fuel tank, you could expect a range of between 310 and 345 miles with a 10% fuel reserve. First-generation Isuzu Impulse, courtesy of Isuzu. 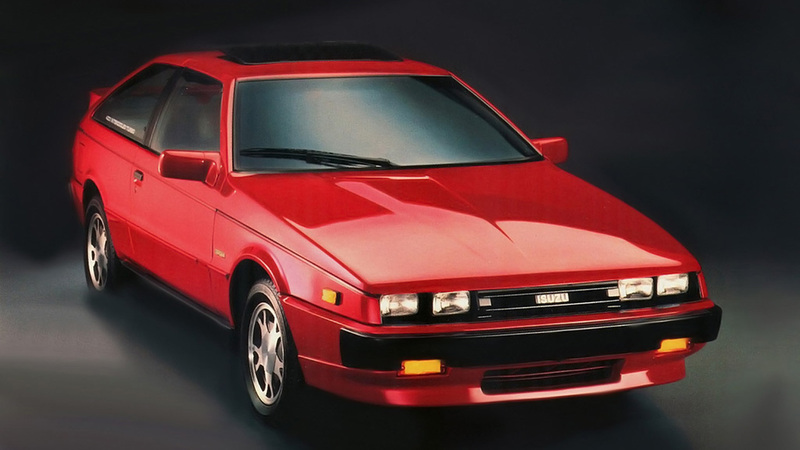 Isuzu gets real credit for messing as little as possible with Giugiaro’s excellent and differentiating design—few automakers were willing to leave as well enough alone as they did. They only did a few things, adding slightly larger bumpers to meet the five mph DOT requirement, shortening the windshield and lengthening the hood to allow for easier installation of the engine on the assembly line, and enlarging the overall dimensions a few inches to allow for more interior space. Impulses of this generation are rarely seen in the Hemming’s Motor News classifieds or on eBay Motors. Make mine Black, please. I must say that my ’83 topped out at 143 mph and it wasn’t even near the yellow line yet. The only reason that it didn’t go faster was the front wheels leaving the ground at 143 mph. This was not turbocharged or modified.